COLD BREW 'N' SERV COLD BREW SYSTEM people & events 1.800.328.4493 info.serviceideas.com/cold-brew-video www.serviceideas.com Enhance your cold brew presentation with the Cold Brew 'N' Serv™ , a simple yet innovative brew basket that turns our rectangular cold beverage dispenser into an all-in-one cold brew coffee maker and dispenser. Easy to use and mess free. 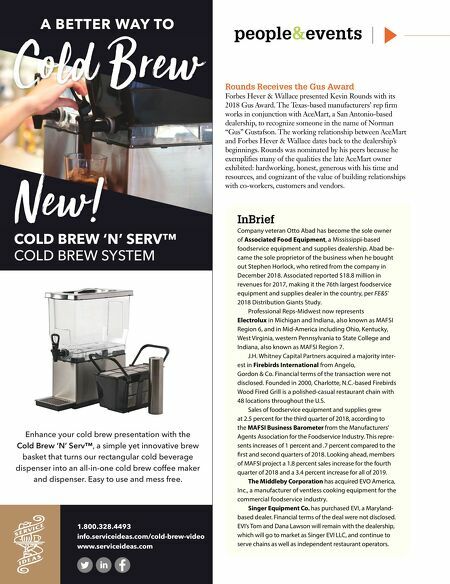 A BETTER WAY TO COLD BREW 'N' SERV™ COLD BREW SYSTEM InBrief Company veteran Otto Abad has become the sole owner of Associated Food Equipment, a Mississippi-based foodservice equipment and supplies dealership. Abad be- came the sole proprietor of the business when he bought out Stephen Horlock, who retired from the company in December 2018. Associated reported $18.8 million in revenues for 2017, making it the 76th largest foodservice equipment and supplies dealer in the country, per FE&S' 2018 Distribution Giants Study. 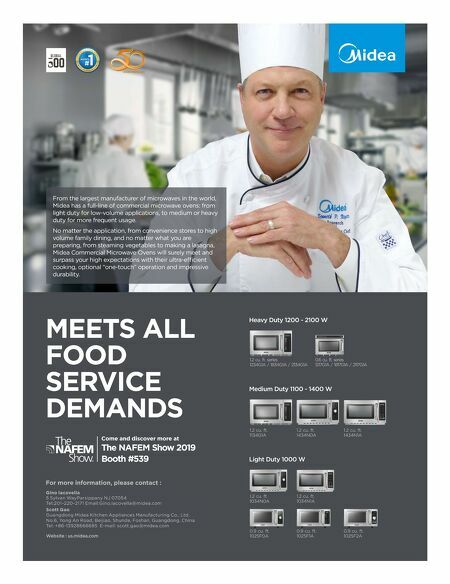 Professional Reps-Midwest now represents Electrolux in Michigan and Indiana, also known as MAFSI Region 6, and in Mid-America including Ohio, Kentucky, West Virginia, western Pennsylvania to State College and Indiana, also known as MAFSI Region 7. J.H. Whitney Capital Partners acquired a majority inter- est in Firebirds International from Angelo, Gordon & Co. Financial terms of the transaction were not disclosed. Founded in 2000, Charlotte, N.C.-based Firebirds Wood Fired Grill is a polished-casual restaurant chain with 48 locations throughout the U.S. Sales of foodservice equipment and supplies grew at 2.5 percent for the third quarter of 2018, according to the MAFSI Business Barometer from the Manufacturers' Agents Association for the Foodservice Industry. This repre- sents increases of 1 percent and .7 percent compared to the first and second quarters of 2018. Looking ahead, members of MAFSI project a 1.8 percent sales increase for the fourth quarter of 2018 and a 3.4 percent increase for all of 2019. The Middleby Corporation has acquired EVO America, Inc., a manufacturer of ventless cooking equipment for the commercial foodservice industry. Singer Equipment Co. has purchased EVI, a Maryland- based dealer. Financial terms of the deal were not disclosed. EVI's Tom and Dana Lawson will remain with the dealership, which will go to market as Singer EVI LLC, and continue to serve chains as well as independent restaurant operators. Rounds Receives the Gus Award Forbes Hever & Wallace presented Kevin Rounds with its 2018 Gus Award. The Texas-based manufacturers' rep firm works in conjunction with AceMart, a San Antonio-based dealership, to recognize someone in the name of Norman "Gus" Gustafson. The working relationship between AceMart and Forbes Hever & Wallace dates back to the dealership's beginnings. Rounds was nominated by his peers because he exemplifies many of the qualities the late AceMart owner exhibited: hardworking, honest, generous with his time and resources, and cognizant of the value of building relationships with co-workers, customers and vendors.